Will a weaker US hand in the Middle East force Bush to reconsider the building of permanent bases in Iraq? 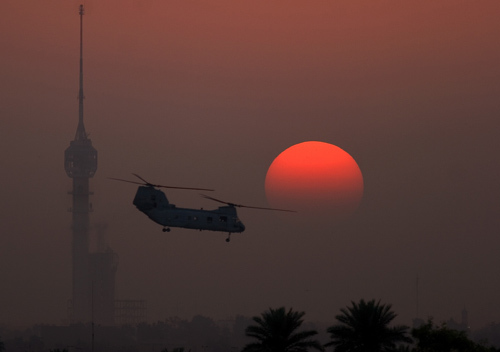 Has the sun set on US influence in the Middle East, and, indeed, worldwide? In the wake of Lebanon II and perhaps a casualty of it, US influence throughout the Middle East is on the wane. Nevertheless, there are indications that the Bush administration is going ahead with plans to build permanent US bases in Iraq. How much sense does this make at a time when the US has lost its ability to set or shape a Middle East agenda? American leverage, prestige and power has never been lower as the Bush administration is all but left out of a shaky cease-fire in southern Lebanon. Even before the Israel/Hezbollah war �called Lebanon II by some observers � America was perceived as having eschewed its role as “honest broker” �thus losing to Iran and radical Islam a position of great leverage in the Middle East. Compounding the difficulty of our predicament is the very real possibility that it was all deliberate. The Bush administration may have willingly relinquished a legitimate role in order to pursue its special oil interests in Iraq. It was a bad and incompetent trade-off. By pursuing illegitimate and dangerous policies, Bush undermined our ability to positively influence legitimate issues. No Democratic goals are realized in Iraq where a puppet regime and an increasingly unpopular American occupation is caught up between three concurrent civil wars: the war between a guerilla resistance vs the US occupation; another involving Kurds vs other northern Iraqi communities; and a third between Sunni Arabs and Shi’ites. Juan Cole recently quoted US Ambassador to Iraq �Zalmay Khalilzad �as having claimed that he had given assurances to sectarian opposition to the US: “We don’t want to stay in Iraq.” But there’s never been any such assurance from either Bush or Rumsfeld. Quite the contrary. Kevin Drum, writing in Washington Monthly, stated that the Bush administration is, in fact, “allocating resources” to build permanent military bases in Iraq. I ask what is the purpose of such permanent bases if not to subjugate the people and control the production of oil? Well, if you’re going to war, obviously troops are going to a theater and to a country and in the immediate aftermath of such a conflict, there would have to be a need for some presence until such time as you can put in place a better system. I mean, the United States has done this many times in the course of the last 50 or 60 years and we always try to get out as quickly as we can once we have reestablished peace, put in place a stable system, it is never our intention to go and stay in a place and to impose our will by the presence of our military forces. �Secretary of State Colin Powell, interviewed on NPR’s “All Things Considered,” October 11, 2002. The United States is committed to stay as long as is necessary in Iraq, but not one day more. �Marc Grossman, under secretary of state for political affairs, February 11, 2003. A four- or five-year occupation of Iraq by 65,000 regular and 35,000 reserve troops – a realistic possibility – will require a rotation base of 260,000 active troops . . . and 315,000 reserve troops . . . This illustration does not properly capture the full effect of our broader “war on terror” on our reservists. . . If another war begins, President Bush will still be able to mobilize plenty of military power. It is occupations that are the problem. If occupation of Iraq stretches into years and the “war on terrorism” widens even further, Army Reserve and National Guard units will be called to active service again and again – an activation rate far higher than the norm expected by our citizen soldiers, their families and their communities. These “quotes” are at odds with hints of “hints” of “major drawdowns” of American troops to a figure of less than 100,000 troops in Iraq by the end of 2006. It is simply not realistic to expect that Bush can withdraw some one-quarter of about about 136,000 American troops in the final quarter of this year! The “administration appears confused and contradictory, a symptom of a lost war and its utterly failed support of Israel in Lebanon II. Nor is there any hope that America will soon regain a position in which it might play a more positive role. Not as long as Bush occupies the Oval Office. If I may paraphrase Antonin Scalia �the man who made possible Bush’s maladministration �the melange of meaningless piffle about Iraq is not a recipe that will instill confidence in the ability of this administration to undo the many harms that it has already done and to right the wrong course upon which this nation is undoubtedly headed. EUOBSERVER / BRUSSELS – A meeting of EU foreign ministers in Brussels on Friday (25 August) saw member states commit up to 9,000 troops to a UN force to oversee the fragile ceasefire in Lebanon. >The agreement means that thousands of UN troops will be deployed to the region within as little as a week. UN Secretary General Kofi Annan, who also attended the meeting in Brussels, welcomed the EU pledges saying they amounted to over half of the total 15,000 troops envisaged under the UN resolution governing the ceasefire. This entry was posted on August 25, 2006 at 6:18 pm and is filed under Model. You can follow any responses to this entry through the RSS 2.0 feed. You can leave a response, or trackback from your own site.